For years, The Bathtub Medic Fresno has been providing professional, quality repair and refinishing services to the residents of Fresno. We offer a variety of different services including shower stall floor and tile repair & refinishing services in Fresno, CA. Repairing and refinishing the shower pan or tiles can help to eliminate the need to completely replace your shower and tiles. There’s no need to replace your shower floor pan and / or tiles when you can repair them and save your money for more important things. In repairing your shower, you’ll want to hire a company with the experience to make these repairs correctly. The Bathtub Medic Fresno has that experience in our finely trained, trusted and knowledgeable team. We will clean out the contaminants in your shower before replacing or repairing broken tiles, followed by a new coat of grout to fill in and even it out. 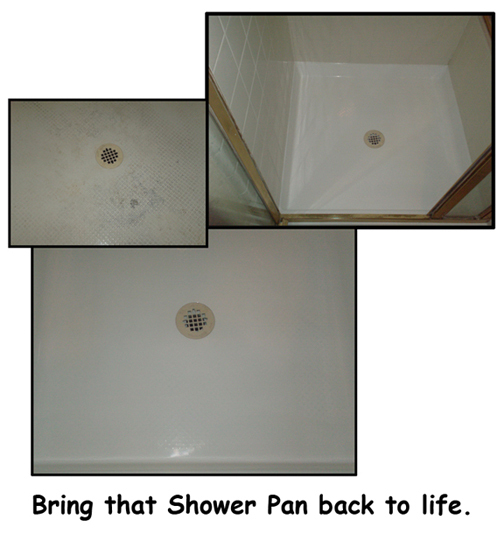 We can also repair cracks in your shower pan by using the proper equipment and products. Extend the life of your current shower, including the shower pan and floor / wall tiles by reglazing them. At The Bathtub Medic Fresno, we specialize in saving you money by offering cost effective alternatives to a complete replacement of your bathroom essentials. Our experienced workmen will deep clean your shower, removing all soap scum, oils, dirt and other contaminants before beginning the process of refinishing / reglazing. By the end, your shower wall and / or floor will be sparkling like brand new! I just wanted to thank you for doing such an impeccable job on fixing my bathroom tub. I was amazed. I cannot even tell the crack was ever there. It’s refreshing to meet people that take time and pride in their work. Thanks for doing such a great job!" Address: Serving the Greater Fresno Area.